EAST HARLEM — New York State is giving $425,000 to small businesses affected by the East Harlem Explosion, Governor Andrew Cuomo announced Wednesday. The money will be distributed as loans of up to $20,000 to eligible businesses in order to aid the ongoing recovery from March’s explosion, which killed eight people and displaced dozens. "I'm backed up in the rent for two months," said Marian Balde, owner of the restaurant Salimata. "We've had a lot of problems. I've been working too hard since the explosion." 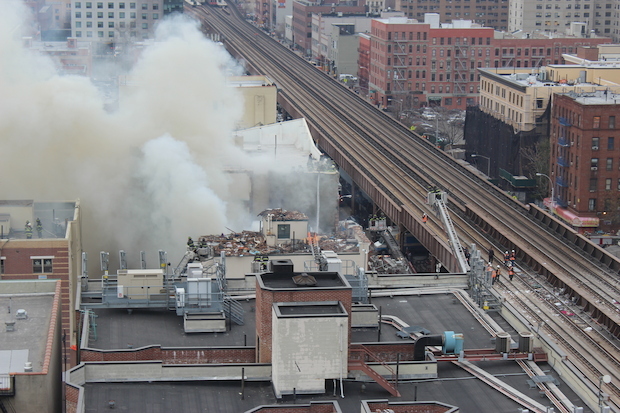 The debris from the blast destroyed to compressor on the roof of his restaurant on 116th Street. Afterwards, he could not get into the building for a week. All of the food went to waste, he said. This money can help him keep the business open. Balde owes Con Edison thousands of dollars, he added. In May, Assemblyman Robert Rodriguez asked the governor to set up a $500,000 recovery fund for business owners. "Small businesses are so vital in making East Harlem unique and serving the diverse needs of our community,” Rodriguez said. “This forgivable loan fund will help our community rebuild and renovate, thereby protecting our local economy." Sixty ground-level businesses were affected by the explosion, according to the city’s department of Small Businesses Services. Two were destroyed, six suffered heavy damage, 15 had moderate damage and 37 were affected by street closings. To be eligible for the loans, businesses must be located between East 115th and 118th streets from Lexington to Madison avenues, have been in operation at least one day before the explosion and must be registered with New York state as a legally established business or not-for-profit. Mark Goldsmith, president of Getting Out and Staying Out, an education and vocational training center for former inmates, planned to apply for the loans as soon as possible. "It [the explosion] put us out of business for two weeks," he said. "We started getting back slowly, it took us almost two months to get operational." Althought the non-profit that sends mentors to Riker's Island is open, the money would help them with insurance claims, he added. Affected businesses seeking to apply for funding should contact the Upper Manhattan Empowerment Zone at (212) 410-0030.